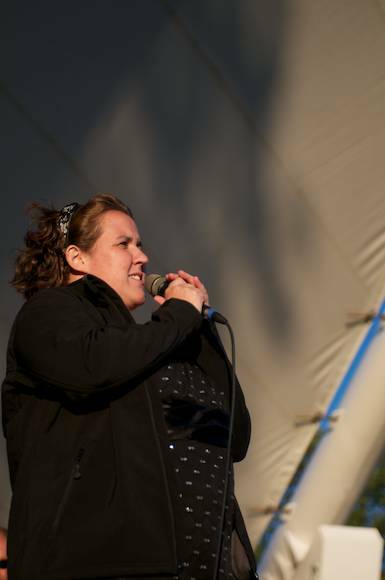 Emily Martin - Photo by Evan HoltLittle Lake Musicfest, which hosts free concerts every Wednesday and Saturday night in Del Crary park, is amping up for its 2012 season. This year Emily Martin will be taking over the role of General Manager from Kathy Kirkland, who had been in the position since 2002. Emily is very pleased with the reception to new additions to the Musicfest last season, such as Children's Day and Musicfest Jam. Emily and her co-worker Ashley Ross (Manager of Development) spend their days busily doing grant writing, budget development, entertainment booking and contracts. Before moving to Peterborough, Emily was the Director of Publicity and Promotions at Sudbury Theatre Centre for two years. She moved here in 2004 with her husband Scott for his job at Showplace. Emily applied as fundraiser for Little Lake Musicfest—then known as the Peterborough Festival of Lights—but hadn't heard back for a very long time. There was a day in 2004 that they had figured that Emily wouldn't be able to find a job in Peterborough. Out of the blue, though, they received a phone call from Musicfest offering her a position because the person doing entertainment bookings had left. She then joined Scott at Musicfest, who became their Site Program Manager. "We love it here in Peterborough," says Emily. "Scott used to commute to Toronto for a job he had at the Ryerson Theatre School each day, and we considered moving because of the long drive." But now, with two kids, the great schools, a house and jobs here, she says they aren't going anywhere. Stay tuned as they are about to make a big announcement on Monday about one of their acts for 2012!